You see your friends rarely and want to spend a few days together again? A wellness holiday in South Tyrol is the perfect chance to cultivate your friendship. For a proper chat is often not enough time in everyday life. Therefore: leave everyday life behind you and have some fun! A wellness holiday with friends at the Dolce Vita Hotels is a relaxing experience. Finally some time to chat about everything without interruption. Talking about old times and creating new memories. The best on a wellness holiday in South Tyrol: you not only cultivate friendships but you also pamper body, soul and mind. The Dolce Vita beauty experts look after your beauty while you and your friends reminisce. TheBERG care product range, especially created for the Dolce Vita Hotels, uses only active natural ingredients. Hectic everyday life reduces the tonicity of your skin – the organic BERG care product range regenerates your South Tyrol’s nature. The Dolce Vita Hotels maintain an innovative partnership from which you and your friends benefit. Choose your favourite Dolce Vita Hotel and make it your basecamp. You and your friends explore the offers of the wellness areas and restaurants of the other Dolce Vita Hotels from there. You like to go shopping with the girls? That is good: Merano is nearby and is perfect for long shopping tours. 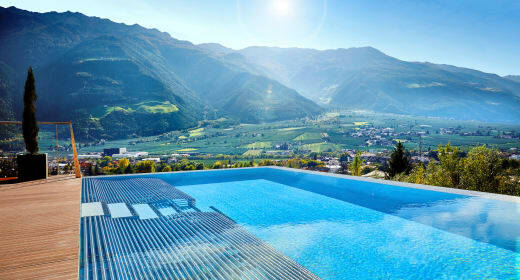 Call your friends now and plan your wellness and shopping holiday in South Tyrol. Take a look at the Dolce Vita wellness areas and look forward to a wellness holiday with your best friends. Send your non-binding inquiry to the team of the Dolce Vita Hotels today.